"What do you want for dinner?" I ask C and Little L in the car every night as we drive home from daycare. "CHICKEN FRIES!" Is the answer, every night as we drive home from daycare. Well, that's not exactly true. Once in a blue moon she'll answer "Fish sticks!" or even maybe "I don't want any dinner." because she's grumpy or tired. Then we get home and I open the freezer, sigh, and pull out the chicken fries, again. Now I'm not saying they eat those every night, but definitely a couple times a week. I'm not proud of it, but to be honest, at the end of a busy day I can't think of a single thing to throw together that will appeal to both C and Little L and won't take too long to cook. And so the chicken fries come out to play, or the fish sticks, or the grilled cheese sandwich. 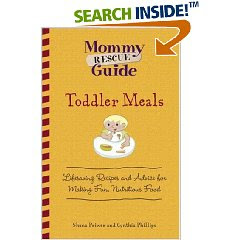 That's where the Mommy Rescue Guide - Toddler Meals, well, comes to the rescue. It's chock full of easy, healthy, tasty recipes and tips for making food appealing to toddlers. The chapters are age targeted, starting with very first meals and moving all the way through toddlerhood. (They even have recipes for teething biscuits!) But the best part are that the recipes are appealing to grown-ups too. So if you're trying to save yourself some hassle and only cook one meal for the whole family you can still use this book. Thumbs up for this nifty little book! And don't forget to check out the rest of the series if you need help with potty training, sleeping, or a whole slew of other issues. Well, they've taken it a step forward by creating an entire The Women behind The Women campaign. It's a movie about women directed by a woman. Not really novel, but sending a young reporter behind the scenes to see how it's all done was pretty neat. All the footage with original interviews and other choice tidbits are available for you to see at Dove.com/thewomen. Check it out, I thought it was pretty cool. And now I'm thrilled to go see the movie. Tonight, with a girlfriend, because even if the movie got terrible reviews, at least now I know really neat stuff about the behind the scenes goings on and I can be that obnoxious person in the audience, except not really, because why would I ruin a perfectly good Girls Night Out? Right? Go check out the footage and come back and tell me what you thought. And if you saw the movie I totally want your feedback on that too! Do you know what your child hears when you say "Stay right there. Don't move a muscle."? They hear "I'm going to be busy for a second, so if you see something cool that you must absolutely explore then go for it!" Well, OK, fine, I might be over exaggerating a bit, but it's definitely true that children react better to short, clear, direct instructions rather than vague ones that don't really have a tangible meaning for them. Which is why "Freeze" works better than "Stay there, don't move." Fewer words to process, fewer possible interpretations. When you need to unload a younger child from the car or gather a day's worth of supplies (jackets, bags, sippy cups, dolls, etc, etc...) you need your child to stand still somewhere safe until you're all ready to move away from the car. You tell them to "Freeze," but sometimes that isn't good enough. That's when the Parking Pal comes in. You know how sometimes the simplest solutions are the best? This product is proof that that's true. It's a cute round magnet with the sketch of a hand that sticks to the side of your car. When you want your child to stand safely by the car you tell them to put their hand on the hand and to stay put. Presto! Safe child. I know that my kid is not the type to run out into the street anyway, but she does love to follow me around the car as I unload everything. I know that your child might not fall for this trick, but it's still worth a try. For us the novelty, and inherent simplicity of the Parking Pal is working like a charm. C jumps out of the car and puts her hand right on the hand and there she stays until I tell her to come with me. Sheer brilliance. Thumbs up for the Parking Pal, cute and simple, like all good products should be. We have a little thing about books in our house. They kind of cover every possible surface: bookshelves, coffee tables, dining room table, night stands, floor. You get the picture. C has always been surrounded by books. By default so has Little L. We read to them and they read to themselves. OK. Fine, what they do is more akin to just looking at pictures and making up stories that go with them, but that totally counts. 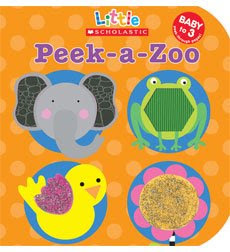 Until I got a copy of the adorable Little Scholastic Peek-A-Zoo book Little L wasn't particular about her books. She'd sit for part of any story we were telling C then wander away to chew on some blocks. Or she'd pick up a book for a moment only to discard it a minute later. 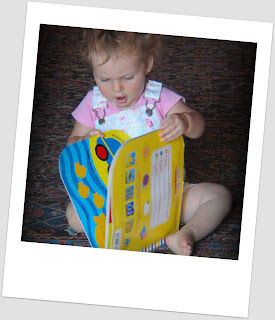 But then I pulled out this big colorful board book and sat her on my lap and we read it over and over and over again. She turned the pages and checked out each and every image. She patted the elephant and cooed at herself in the mirror. She said hi to the baby and poked her fingers through all the openings. And when she was done she did it all again. Unlike many new toys the attraction for this book hasn't worn off. It's still her favorite way to spend a quiet few minutes and it's one of the only distractions that will quell a raging tantrum in the car. That makes it my favorite book in our extensive library. Definitely a thumbs up for this fun little board book! Were you a little girl in America in the early 80s? 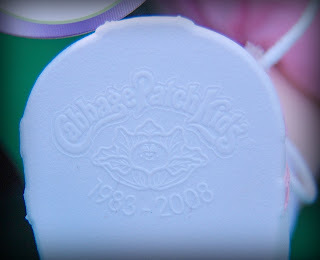 Did you have a Cabbage Patch Kid? Or two? Or three? Yeah. Me too. I might have been born in a foreign land. I might have learned to speak English pretty late in the game. But by the time the Cabbage Patch Kid craze hit the States I was right there begging my parents for a 'Kid of my own. Lucky for me my mom understood how crucial it was for me to own one of the much coveted dolls. In fact she got me two, one preemie and one with blond braids, just like me. Then she went out and found some Cabbage Patch Kid clothes patterns and made my babies some snazzy duds. My mom's cool like that. Then I grew up, I know, so rude of me, and my dolls languished in my mother's attic in the heart of the Loire Valley in France, waiting for someone to come rescue them. They waited and waited, until finally my little girls were born and my mother came to their aid. My old, slightly moldy smelling friends took a little overseas trip and landed at our door where they were welcomed with squeals of delight. And there I thought the story would end. But the wonderful people at Cabbage Patch Kids didn't think that was right. You see, they know that all those little girls who once hankered for Cabbage Patch Kids all those years ago would want their own little girls to experience that love. And so they decided to recreate each and every one of those original dolls. Yup, the same dolls. Exactly the same. Limited Edition 25th Anniversary 'Kids. Hitting store shelves any time now. Now I don't know about you, but that kind of makes me want to rush out to the store to see if I can find the replica of my own two 'Kids. No? I mean, I still have them, but it would be pretty cool. Do you still have your 'Kid? Do you have fond memories of that 'Kid? Hurry over to the Cabbage Patch Kid site and share your pictures and stories with other children of the 80s. Then check out your local toy store, you know, just in case they have the twin to your old friend. Over here we're getting to know a new pal. I think it's going pretty well. Though we're definitely going to have to get a second new 'Kid or the squabbles are never going to end.